A/C Flush, A/C Flushing, Condenser Flushing, Evaporator Flushing, Engine Cooling Flushing, Radiator Flushing, Heater Core Flushing, Charge Air Cooler Flushing, Trans Oil Cooler Flushing, HVAC Flushing, Line Set Flushing, Swimming Pool Flushing.....Tools, Equipment, Chemicals, & Procedures for Heavy Duty (Truck, Bus, Military, Fleet, & Equip. ), Automotive, Aviation, HVAC, Marine, and other similar applications…….. Condenser Flushing - Yes you can!!!! 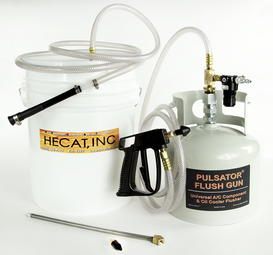 ……..
HECAT, Inc. is a US Manufacturer of (heat exchanger) flushing and cleaning equipment, tools, adapters, and chemicals. Applications for air conditioning flushing, transmission oil cooler flushing, engine cooling flushing, and many other similar type flushing and cleaning processes. Validated and OE approved products, proven procedures, and unrivalled product warranty, service, and support. Explore this web site for more details about the products, processes, patents, technology, and applications. Cannot find what you need? Have a few questions? Please e-mail tech-info@hecatinc.com, or call 770-205-5600.